Rakusan did not include the Fan Series in his main sequence numbering. Therefore, the original number used for each of the 36 Series prints has been modified to identify the Fan Series members of its theme. The five different fan silhouette shapes have been here assigned arbitrary numbers 1 through 5. To indicate a fan design these shape designations are added to the 36 Series number separated by a hyphen. 124-1 is the Fan Series design with fan shape 1 in the 124 Bonsai Plum theme. Like all other designs in this series, 124-1 was only produced in a single print run, and few copies are currently documented. The individual designs were completed in at least two different stages. The theme assignment issues and the signature and seal markings of the flowering plum designs suggest that their Fan Series prints are best considered together as a single unit of fifteen designs. Fully thirteen of the fifteen Fan Series designs (including 124-1) have seal C which indicates a carving date during the first half of 1934. The other two fan designs have rare minor seals whose carving periods remain to be determined, one example each of seal Q and seal R. They may in fact both also be from within the same major seal C period (which would make all of the plum fan designs contemporaneous). After preparing the wooden blocks for these relatively early designs, Rakusan set them aside for several months. 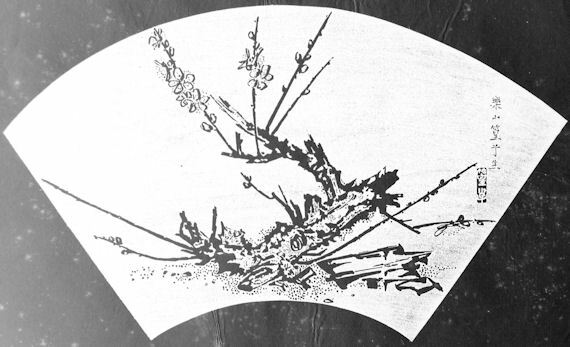 Two of the three 36 Series flowering plum designs, 122 and 123, have seal B which indicates they were not carved until the following period, and perhaps not until shortly before their publication with the Fan Series designs later in the year. 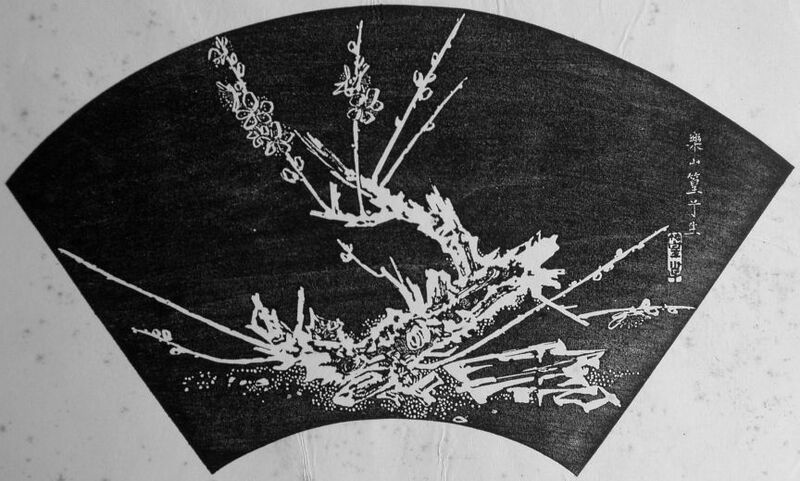 The third 36 Series flowering plum design, 124, is the sole woodblock print example of minor seal D whose carving period is indeterminate between the sequential major seal C and seal B periods. The composition of 124-1 includes an entire dwarfed flowering plum. The ground surface is indicated by patterns of small dots. Larger irregular shapes on the ground appear to represent stones, including the abstract shapes at lower right. The entire composition is rendered in a roughly flowing, silhouetted style.